With almost 30 years of experience, and over 10.000 installations worldwide, HUR is a world-leading supplier of computerised exercise solutions – with strength training equipment and operating software, especially designed for evidence-based exercise, active ageing and rehabilitation. The solution offers easy exercise control including automatic setup of training load, seat and lever arm position. A vast amount of data is automatically recorded from each training session. This accurate and objective data (sets, reps, performed load, ROM, power etc.) can then easily be reported and exported to external software for research purposes. Visit us at www.hur.fi or at the IAGGER conference booth no. H02:12 in Gothenburg to learn more about our solutions. We would like to make you aware there are currently a number of scam companies setting up predatory websites and also contacting participants registering and attending events around the world, pretending to be part of the IAGG-ER organization. Please note that IAGG-ER or the conference bureau Sweden Meetx will never contact any participant or exhibitor directly to sell hotels or make any kind of travel arrangements. 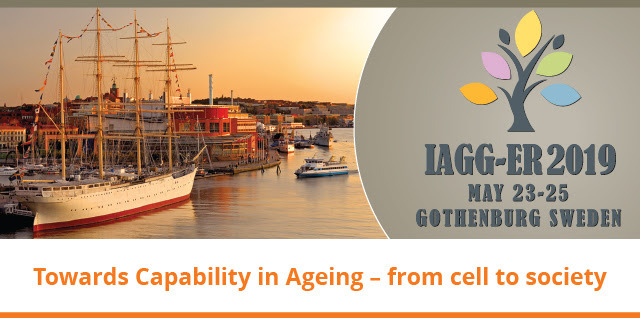 The registration and hotel booking platform via the IAGG-ER congress website is run only by the conference bureau Sweden Meetx. If we contact you for any matters it will be either by email coming from iagger2019@meetx.se or from a+46 number.